Zika virus (ZIKV) was first identified in 1947 from a rhesus monkey in the Zika forest of Uganda. Human cases were later reported in both Africa and Asia. Since 2013, human infection with the Asian lineage of ZIKV in the South Pacific and the Americas has been reported to be associated with Guillain-Barré syndrome (GBS), meningoencephalitis and congenital microcephaly. However, there are currently no FDA-approved drugs available for the prevention or treatment of ZIKV infection or its associated risk of congenital defects. XU Zhiheng’s group from the Institute of Genetics and Developmental Biology, Chinese Academy of Sciences, found that chloroquine could significantly suppress ZIKV infection in vivo and prevent forming its associated congenital microcephaly. They first screened 16 EBOV entry inhibitors reported previously via cell infection experiments, and found the FDA-approved drugs chloroquine (CQ), clomiphene, amodiaquine, alverine and sertraline could inhibit the early stages of ZIKV infection. Next, they tested the ability of CQ to protect against ZIKV infection in vivo using BALB/c and IFN-α/β receptor (IFNAR)-deficient A129 mouse model, and discovered that the viremia in both models were significantly reduced after CQ treatment. Their work revealed that CQ is a potential drug which would be used to treat ZIKV infection after clinical test. 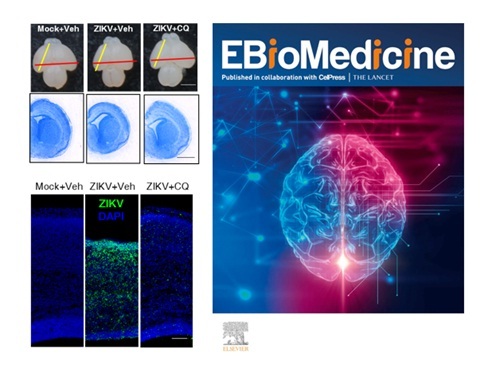 This work entitled “Chloroquine, a FDA-approved drug, prevents ZIKV infection and its associated congenital microcephaly in mice” was on-line published in Ebiomedicine on September 28th, 2017 (DOI:10.1016/j.ebiom.2017.09.034). This work is supported by grants from National Natural Science Foundation of China and the Ministry of Science and Technology of China.